To order the digital version of the complete set of the keepin’ it REAL Program materials (grades 6-8) with a two year license, click “Purchase” and place this product in your cart for purchase. You will be directed to a link for downloading your files. 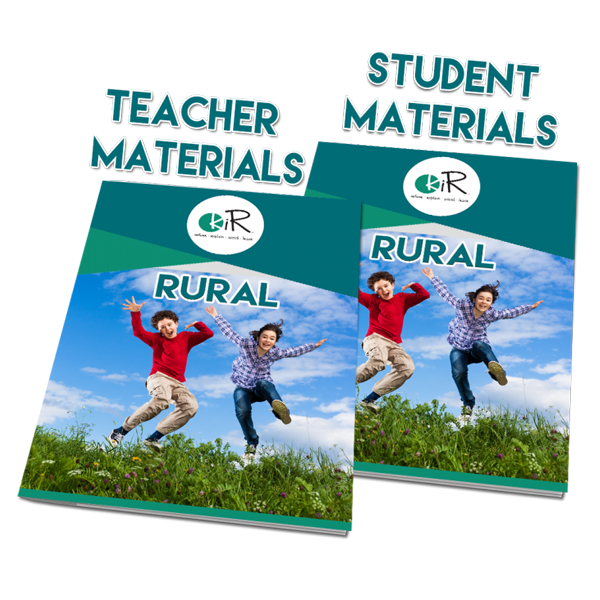 The rural bundle includes materials developed with and for students living in rural area of the U.S. This process “culturally grounds” the curriculum in youth culture. In the RURAL program we present a rural kiR, grounded in the stories and experiences of rural youth. Until now, none of the evidence‐based or scientifically validated prevention curricula served the needs of our nation’s rural youth, who experience many of the same drug problems as those in urban and suburban setting, but also have their own culture. Recognizing this need, Penn State and Ohio State worked with students, teachers and prevention experts in rural communities to develop a curriculum that retains the core elements of keepin’ it REAL while grounding the lessons in rural youth culture. These elements include having a kid‐centric, narrative philosophy and focusing on critical thinking and effective communication, while using examples rural kids can relate to more easily. 1. Identify the keepin’ it REAL resistance strategies of Refuse, Explain, Avoid, and Leave. 2. Describe the five steps of the ABCDE decision-making model. 3. Apply the ABCDE Decision-making model to everyday situations. 4. Explain how their decisions can impact future goals. 2. Identify the positive and negative consequences of risk. 3. Differentiate between healthy and unhealthy risks. 4. Explain how taking risks may affect their goals. 1. Explain what it means to agree to disagree. 2. Demonstrate the differences between assertive, passive, and aggressive styles of communication. 3. Express why assertive communication is an effective strategy. 1. Explain the resistance strategy of Refuse. 2. Demonstrate the assertiveness techniques of Repetition, Acknowledge and Maintain. 3. Pair non-verbal and verbal techniques with other refusal skills to create a more effective refusal strategy. 1. Define the resistance strategy of Explain. 2. Justify their actions in a clear way. 1. Define the REAL strategy of Avoid. 2. Explain how planning ahead can be used to avoid a situation. 1. Explain the REAL strategy Leave. 2. Identify situations where leaving is the best option. 1. Explain the difference between actual and perceived norms. 2. Identify the actual norms of alcohol, tobacco, and drug use among their peers. 1. Identify situations that may cause them stress. 2. Explore healthy ways to deal with stress. 1. Explain four different ways to ask for help. 2. Identify their short- and long-term goals and related worries. 3. Discuss the key concepts covered in the kiR curriculum.